"Interventional cardiology is an ever-expanding specialty with endless technological advances in the fields of coronary, structural heart and peripheral vascular diseases. These are utilized to plan and perform a procedure to deliver the best results to the patient. It is a true privilege to earn a patient's trust and help them heal." 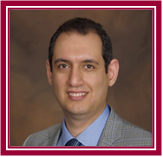 Dr. Peyman Naji is board certified in cardiovascular disease. He completed his internship and residency at Wright State University, Boonshoft School of Medicine in Dayton, Ohio. His fellowship was completed at State University of New York, Upstate Medical University in Syracuse, New York. Dr. Naji joined the group of Dr. Eisenstein, Dr. Madrid and Dr. Rawal at South Coast Heart and Vascular in Lakewood, California.